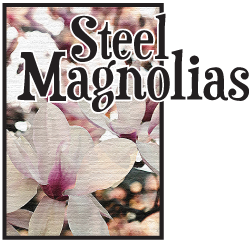 Steel Magnolias serves up a slice of life in Louisiana that's as warm and comforting as sweet potato pie. In the haven of Truvy's beauty salon, six very different women come together to share their secrets and bare their souls, throwing in a little neighborly gossip for good measure. From weddings to divorces, babies to funerals, new beginnings to happy endings, they weather every event in their lives en masse with grace, determination, and perfectly coiffed hair. MILDRED AUSTIN (Ouiser Boudreaux) Mildred returns to the theatre after a hiatus of 30 years. In "another lifetime," she acted, directed and costumed in community theatres in Fort Worth and South Bend, Indiana and taught theatre in high school, university and at Casa Manana Theatre in Fort Worth. Favorite roles include Edith in THE WOMEN, Frosine in THE MISER and madame Elizabeth in LOOK HOMEWARD, ANGEL. She has a BFA and MFA in theatre from TCU. The past twenty years she has spent in another love--showing purebred dogs. She has a kennel full of beagles and is still active in that sport. She counts herself very lucky to having a loving, patient husband of 28 years, Sam. "I auditioned for the play hoping for a part--what I received was the opportunity to meet a group of the most interesting, funny, caring and overall amazing women!" DANIELLE BEACHAM (Director) Is glad to be back at her home away from home! JaceSon, Tina, Aaron, and Milette have been such an inspiration to her and her dear dear friends. This is Danielle's third show to direct and it has been an honor working with such an amzaing cast of women. She was nominated for best director by the Collomn Awards for CASH ON DELIVERY here at PTC and just closed BAREFOOT IN THE PARK at Artisan Center Theatre were she currently works as the Director of the Homeschool Education Program. Danielle's life has been filled, stuffed, covered, booked and runover by theatre for the past eight years and she loves it! Her next endeavor will be playing Ruth in 7 BRIDES FOR 7 BROTHERS so come see her! Miss Beacham will be putting theatre aside for a year and moving out to CA. to attented Bible schoole in the fall. The real love of her life is the Lord. "Thank you to my unbelievable family, my senior girls whom I will miss dearly, and this inspirational cast! To God be the glory. Matt. 6:33"
COURTNEY HOWELL (Annelle Dupuy Desoto) This is Courtney's second show at the Plaza, and she has enjoyed every minute of working with the wonderful ladies. She has appeared as Lucille/Stenog in THOROUGHLY MODERN MILLIE at the Plaza. Courtney also enjoys singing, writing and song-writing. She hopes you will enjoy watching this show as much as she has enjoyed performing it. BARBARA RICHARDSON (M'Lynn Eatenton) Barbara Richardson is delighted to be performing in her first Plaza Theater production and in one of her favorite plays! She has previously appeared in numerous community theaters around the DFW area. Her most recent role was that of Mrs. Banks in "Barefoot in the Park" at the Artisan Community Theater in Hurst, TX. She feels blessed to have been cast with such a wonderful group of strong, talented, caring women. They are true "Steel Magnolias" just like their counterparts who frequent Truvy's Beauty Shop in Chinqapin Parish. TRICH ZAITOON (Truvy Jones) Trich is thrilled to make her debut at the Plaza. Trich works in theaters all over the Metroplex and was last seen as Mrs. Rosen in KRINGLE'S WINDOW at Theatre Arlington. Steel Magnolias is one of her favorite plays as this is her 5th production of it. Trich will tell you that Shelby's legacy lives on as this show brings together a cast and crew as strong, tough, courageous, beautiful and remarkable as the characters that make up Steel Magnolias. "I know exactly how lucky I am to be a part of this production. Thank you ladies."